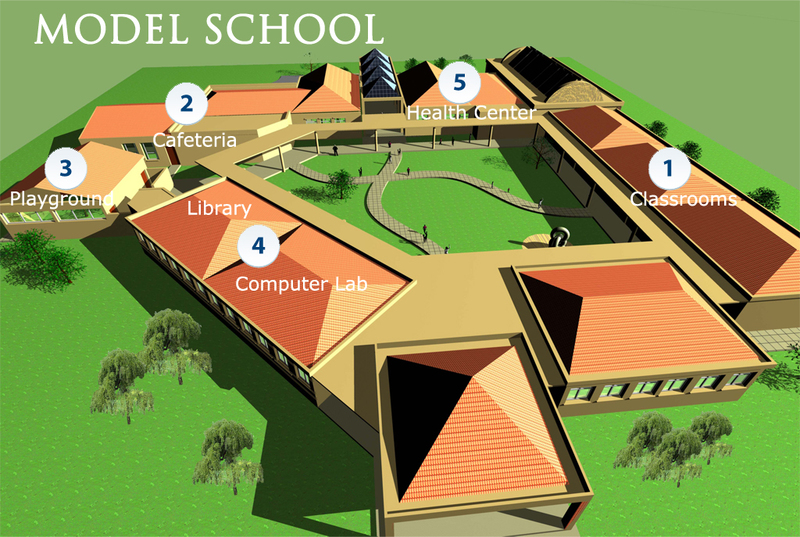 Welcome to our model school….when it is finished, the model school will improve the education experience with better classrooms, modern library, more computer access, a health center and a larger cafeteria. PROGRESS UPDATE: As of January 2014, we are waiting for approval from the Ethiopian government to grant us land and permission to build. CLASSROOMS – The model school will have 6 classrooms, 3 for pre-K and kindergarteners and for grades 1 thru 4. With real floors, better desks, lighting and ample spaces to create different subject stations (science, art, etc), the students will have more ability to do hands-on learning and explore the world around them in a fun environment. LIBRARY –Better and more shelves, expanded study areas including reading nooks, the new library will be segregated from the computer lab and offers a quieter study-experience. It will not only benefit the students, but it will be available to other students in the community. COMPUTER LAB – Doubling the number of computer stations from 10 to 20, the new computer lab will allow for one-on-one tutoring and additional resources for teaching. Also another community resource, the computer lab will be open for the public during non-school hours, allowing families in the community to connect to the world. CAFETERIA – Our current cafeteria is so small that our meal times are on a rotational basis. With the new cafeteria, we will be able to feed 200 kids at one time, helping to improve efficiency and better manage the time for learning. We serve 2 hot meals a day – breakfast at 10 am and lunch at 12:30 pm. HEALTH CENTER – Without an on-site health center, we take our kids to a local clinic for exam and medication, the nearest being about 30 minutes away. With a Health Center on campus, we will be able to treat the students for minor injuries (scrapes, cuts) and common illnesses (flu/cold, innoculations). The center will have a full-time nurse and also visiting doctors on a volunteer basis. In addition, the health center will operate as a neighborhood clinic for the surrounding communities.